← Great Escapes | Volume 1 is GO! 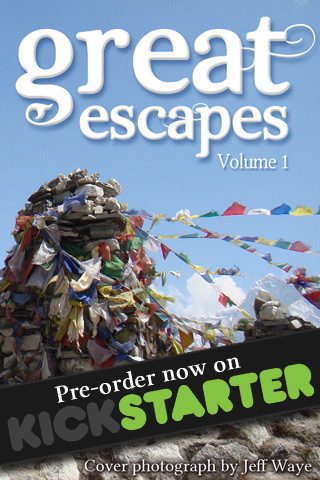 Our Kickstarter campaign for Great Escapes | Volume 1 has been a rousing success. We’ve raised a total of £507 so far, well above our original target of £400. That’s really going to help us produce a great book and invest a little in the production of future titles. There’s still around 8hrs left to make a pledge to get some great rewards, some of which will no longer be available once the campaign ends! These include original artwork from illustrator Kat and the “Round the World Book Tour”. Visit the Project Page to find out all about the project and don’t forget, more information about the added rewards is available in the Project Updates. With Cyborg Kitty, the home and haunt of our illustrator Kat. Kat explains how she got involved with the project and we talk more about why we chose to include illustrations in a book for adults. With author Steve J McHugh. We visited the blog of our writer friend Steve, who has successfully broken into the self publishing market with his book Crimes Against Magic. There we talk about Kickstarter and why we chose to use crowdfunding to produce Great Escapes | Volume 1.